Seven45, the studio behind the poorly-received Power Gig: Rise of the SixString, is laying off employees as part of what it calls the "natural cycle of game development." 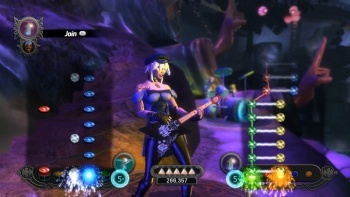 You might recall Seven45 Studios as the developer that promised to create a music game using a real guitar as the controller. Or you might recall them as the guys who dumped hundreds of Guitar Hero controllers into an Icelandic volcano as a publicity stunt-slash-offering to the gods to bring success to their game. Or perhaps you'll recall them for the fact that the gods ignored their pleas and that Power Gig: Rise of the SixString was a bit of a critical disaster, pulling down a Metacritic score of - wait for it - 37. Whatever the reason, treasure those memories because the studio is undergoing what you might call some pruning in Power Gig's wake. The Twitter account "veracious_shit" reported yesterday that Seven45 had been hit with "major layoffs" that had left the studio "decimated," a revelation confirmed at least in part by the studio itself. "With Power Gig already on store shelves, last week Seven45 Studios restructured the company both as a part of the natural cycle of game development and to focus on the development needs of its upcoming games projects," the studio told Joystiq. "The studio thanks everyone who contributed to our first game, Power Gig: Rise of the SixString, and we wish the individuals impacted by the re-organization all the best." A source said 20 to 30 people were cut, including most of the QA team and some full-time staffers, which would jibe with the idea of post-release staff cuts. Then again, given the fate that's befallen the more well-established titles in the genre, it's not too hard to imagine that a studio putting out a "near-unplayable mess of a rhythm title" - not to mention one that costs 200 bucks for the full package - would suffer for it fairly quickly.